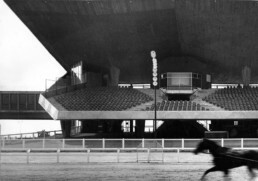 The hippodrome of Tor Di Valle, located at the 9th kilometer of the Via del Mare in Rome, Italy, was built to host harness racing competitions as part of the vast construction programme set up for the 1960 Olympics. pivoting frames on the back. 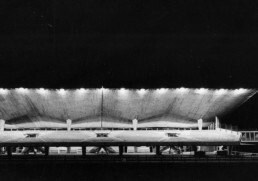 It is a highly innovative project for its time: the reinforced concrete canopy is formed by combining 11 “umbrellas”, whose geometry is composed by combining four sections of an hyperbolic paraboloid-demonstrating an advanced level of research and is supported on just a few sculptural pillars. The idea is the very basic one of combining few materials, such as glass and visual concrete, in a powerful and essential form. The great quality of the boarded visual concrete, recognisable throughout all the structural elements of the project, is due to the high level of skill of builders and concrete foremen working in Italy in the 60s. 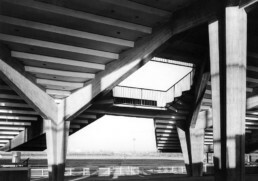 Designed by the Architect Julio Lafuente and the engineer Gaetano Rebecchini with the structural engineer Calogero Benedetti, the construction of the hippodrome started on site in 1957. Finally, in 1959, the formwork for the last umbrella was struck slowly revealing the largest hyperbolic paraboloid structure in the world. Unfortunately, the structure today is in very bad repair. 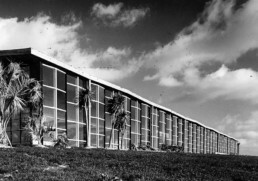 This is due to both a completely absent maintenance regime for the last few years as well as a series of architectural interventions, such as partitions that closed off part of the canopy’s cantilever, ceiling finishes that completely hid the “umbrellas” and a loss of the pivoting function of the glazing.